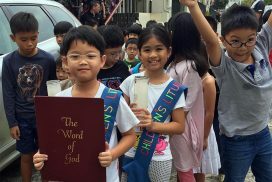 Each Sunday, we celebrate the order of the Mass (Liturgy of the Word) and break the Word in an age appropriate manner with the children, so that they understand and be enriched in their awareness of God's love, the humanity of Jesus and the seasons of the Church. The Liturgy of the Word with Children centres on Jesus and his message. It is a special time for the children to hear Jesus speak to them. We are on duty every Sunday during the 11am Mass (except during school holidays) and preparation meetings occur once a month. We also plan and conduct children-specific events for key feast days/occasions (Advent, Christmas, Children's Day).